CORNER UNIT GROUND FLOOR (NO STAIRS)--3 BEDROOM/ 2 BATH "LIKE NEW" UNIT THAT ALL OF MY PET LOVERS AND STAIR HATERS HAVE BEEN WAITING FOR!!! 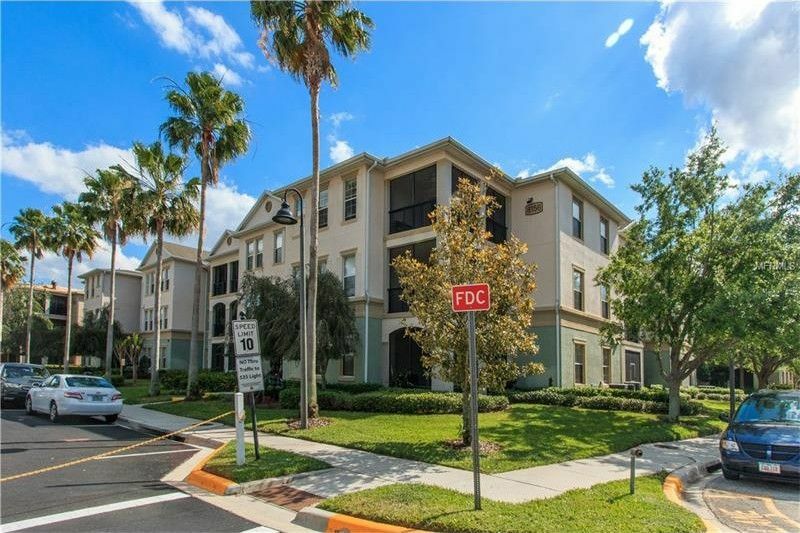 LOTS OF GREEN GRASS AND MATURE PALMS/PLANTS SURROUND YOU!- BRAND NEW PADDING & CARPET, BRAND NEW HARDWOOD ENGINEERED FLOORING, BRAND NEW STAINLESS APPLIANCES/RANGE HOOD VENT-MICROWAVE, NEW HARDWARE, GRANITE COUNTERTOPS, DK. CHERRY CABINETS, AND SPLIT PLAN SET-UP WITH DINING ROOM, LARGE FAMILY ROOM, LAUNDRY CLOSET INCLUSIVE OF WASHER/DRYER! LARGEST FLOOR-PLAN DESIGN OF THE 3 BEDROOM LAYOUT OFFERINGS FROM ASHTON WOODS HOMES, AND INCLUSIVE OF A LOVELY SCREENED IN PORCH/PATIO OFF LIVING ROOM TO WATCH THE NIGHTLY WALT DISNEY WORLD FIREWORKS SHOW! RESORT LIVING POOL/VOLLEYBALL AND SAND COURTS, AND ELEGANT DESIGNER CLUBHOUSE WITH FITNESS CENTER IS A MERE FEW STEPS DIRECTLY OUT OF YOUR FRONT DOOR!!! ROOF, BUILDING EXTERIOR, SECURITY, AND TRASH PORTER SERVICE ALL INCLUDED IN THE ULTRA LOW MONTHLY CONDO HOA FEE. SIMPLY ARRIVE, OR COME HOME FROM WORK AND KICK YOUR SHOES OFF, POUR A BEVERAGE AND ENJOY!!! LET YOUR PROPERTY MANAGER HANDLE THE REST!!! CONDO-WARRANTY INCLUDED ON THIS HOME! SUCH AN INCREDIBLE VALUE AT THIS LOCATION THAT IS GAINING EQUITY(FAST). NEW WINDERMERE HIGH SCHOOL ALMOST COMPLETE, AND WINDERMERE VILLAGE WITH FRESH MARKET GROCERY IS FRESH OFF OF THE DESIGNERS DRAWING BOARD....... ACT NOW! E-Z TO VIEW .....and....... LIKE NEW NEW NEW!!!! Driving Directions: I4 to CR 535.Winter Garden Vineland North to Right on Amidship Lane-BUILDING ON YOUR RIGHT AT CORNER OF AMIDSHIP AND BOAT HOOK (8156 BOATHOOK). UNIT #608 is 101.--FIRST FLOOR ON RIGHT AS YOU GO THROUGH BLACK METAL ENTRY GATES.